The diversity of the alpine architecture has developed over centuries by a careful handling of narrow resources and frequently challenging environmental conditions in the various regions. By utilizing local resources for resolving particular problems, creative solutions were found and practically tested over generations. Their beauty consists to a great extent in their mature and intelligent adaptation to specific local conditions – a beauty that shows from ample settlement structures down to minute details of craftsmanship. 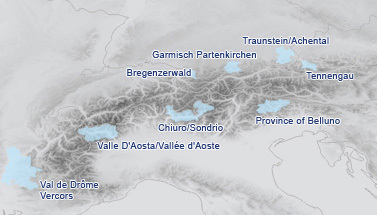 Cultural heritage and ecological innovation are not opposites but go together intrinsically: The alpine building and settlement patterns contain an endogenous wisdom that can teach us the principles of dealing with the regionally diverse conditions of the Alpine Space in ways that are sustainable and preserving resources. This ancient knowledge is in danger of getting lost today, unless we make a conscious effort to investigate it. Only by deeply understanding the principles of vernacular architecture we will be able to use them properly under today’s conditions and to develop them further.